Grab your sombreros and top up your Margaritas as homify 360° jets off with you to Valle de Bravo, Mexico, for a look at one stunning creation. Here we will see how a series of spaces connect with outdoor corridors, terraces, shutters, beautiful gardens and stone walls to culminate in an extremely welcoming and wonderful residence. Our discovery today comes from Mexican team A Mayúscula Arquitectos, who have taken contemporary Mexican architecture and combined it with traditional materials like wood and stone. To that, they added joyful bright colours, fresh vegetation, some raw materials for a touch of rustic, and a handful of modern elements. Let’s see what they’ve accomplished. At first glance, we are met by a sturdy and protective character that encompasses the house. The stone facade of the garage merges eloquently with the stone flooring, while splashes of wild vegetation sprout up naturally among them. 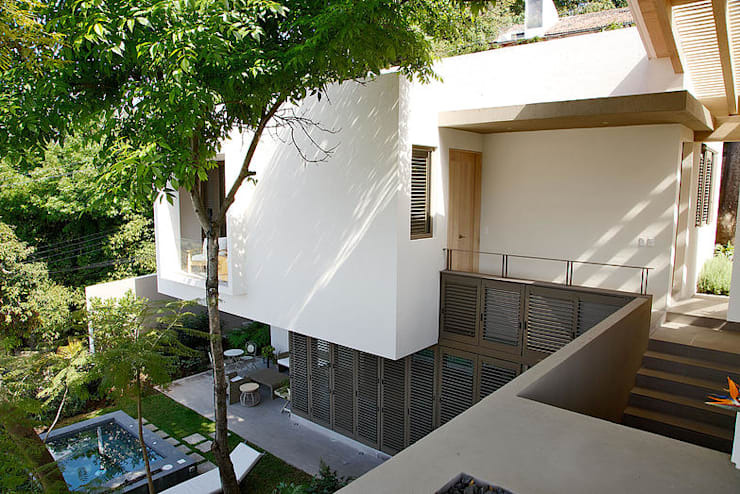 Those who wanted to complain about the harshness of the facade can just look to the healthy helping of trees and plants that lend a soft and welcoming look to the house. 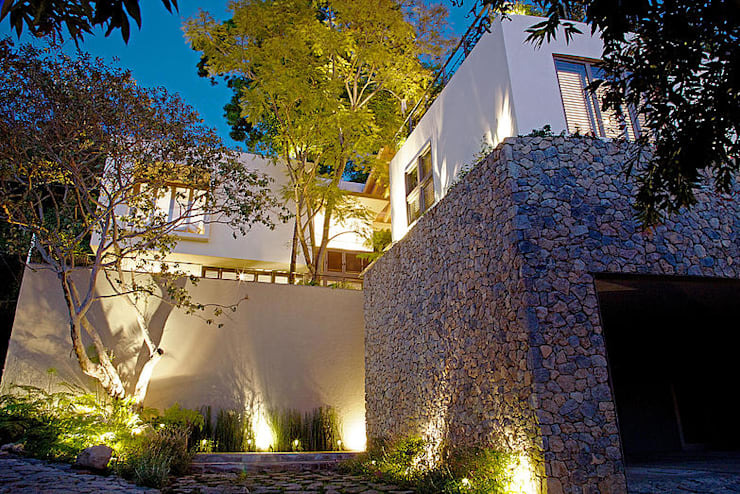 Add to that the twinkling of garden- and interior lighting, and we have a dazzling invitation to approach this striking vision of a house. A hop and a skip away from the open courtyard we find the dining space, fit for a traditional Mexican feast. 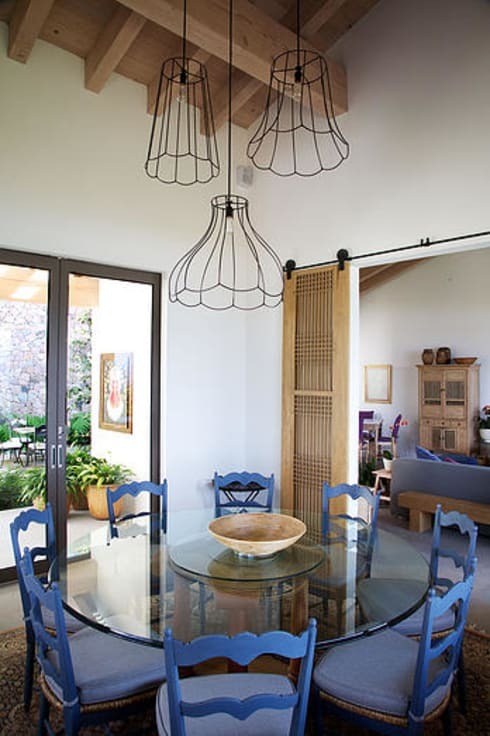 The bright blueness of the country-style chairs add some coolness to the area, offsetting quite nicely with the modern glass table. The hanging lanterns suggest mere outlines of lamps rather than the real thing, yet they bring more than their share of illumination at nightfall. We know the uniqueness of the eclectic style, and here it has been achieved to perfection to welcome us to a warm and friendly room fit for a loud and jabbering family. 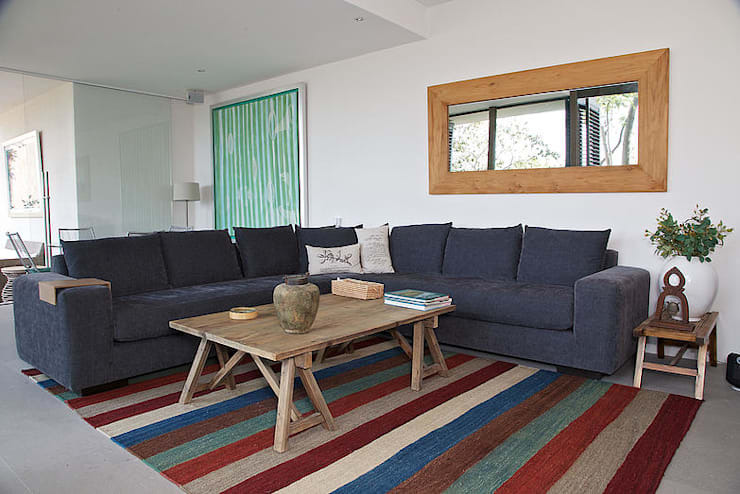 We locate the living room, which greets us with a welcoming embrace of colour. The L-shape couch presents a soft coolness with its denim blue tone; the rug portrays a rustic sense while adding some elegance and sophistication to the room. As we know, wood is always welcome in a house, and here it has been used to perfection in the shape of the coffee table, side table, and mirror frame. Notice how well it contrasts with the soft fabrics of the couch and rug. Feel free to view these homify-approved: Tips To Create A Really Cosy Living Room. The bathroom is the room that opted for shiny glamour and sophistication. In contrast to the living room, all details here are of a more delicate nature. 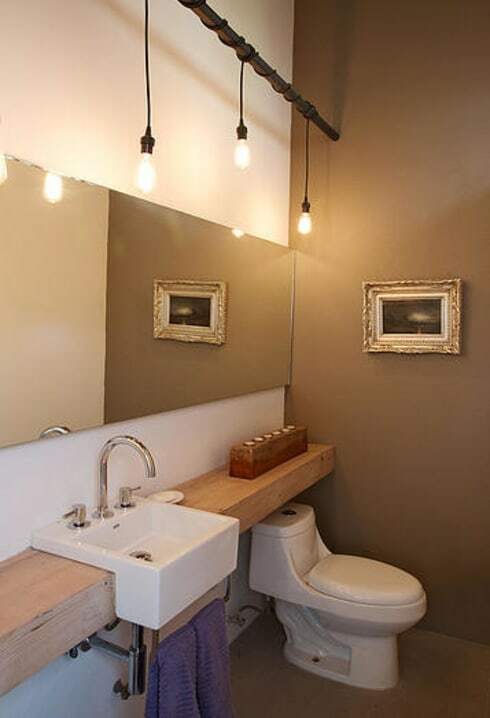 Notice the polished wood making up the bathroom counter, and how it offsets with the gleaming porcelain of the basin. To keep the eclectic vibe alive and beating, we have a classic picture frame against the wall, and some industrial-style lighting hanging from a pole above the washing area. It’s these subtle touches of charm and elegance that make this bathroom a particularly welcoming space. 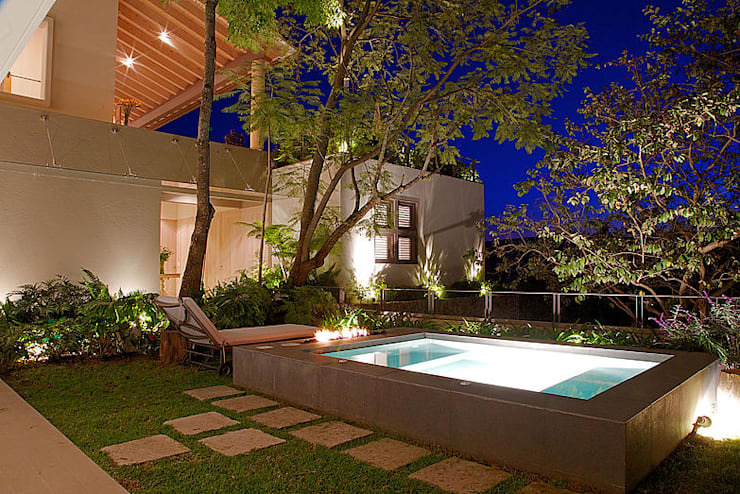 From here we get a look at the courtyard, where a terrace, small pool, and garden add some magic to the house. See how stunningly the rooms upstairs are connected via exterior corridors, blurring the line between in- and outside. The ground floor offers sun protection through exterior shutters/blinds to allow for the desired amount of natural lighting to stream indoors. This element also adds some colour and warmth to the facade, and contrasts deliciously with the greens of the surrounding gardens. 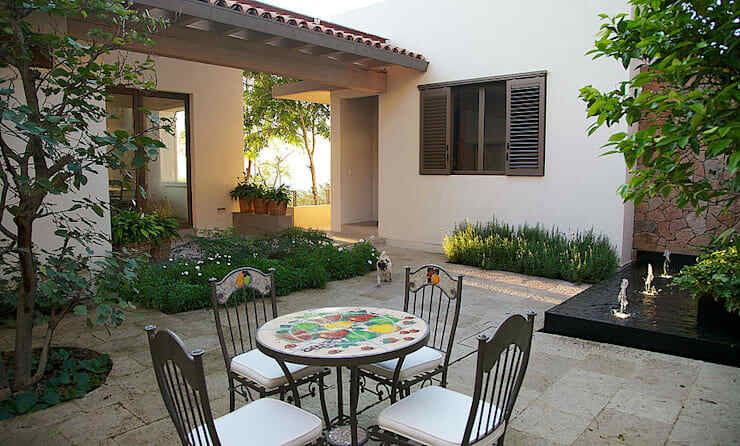 This terrace absolutely screams Mexico, and we love it. Rope-covered columns add a unique detail to the area, while the wooden beams and red roof tiles ensure some raw colour to accompany any social visit. And since we’re here, we might as well get comfortable on that inviting wicker furniture and lose ourselves in the tranquillity of this beautiful space. 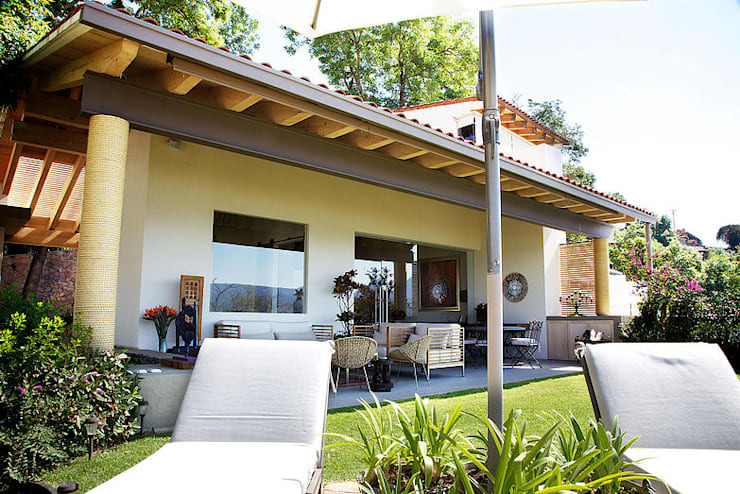 Whether you’re a devoted follower of the rustic style or a lover of all things modern, you’re sure to fall in love with our spectacular collection of balconies, porches and terraces. … the small pool gets transformed into a glowing blueness that illuminates those cool waters superbly (night-time swim, anyone?). This is the ideal space to end our tour, as it welcomes us to sit down and enjoy the quiet night air, made so welcoming by that fantastic lounger and exterior twinkling lights. A superb mix of modern structures, colourful elements, and nature at its greenest. What is not to love about this house?